Local "Optician to the Stars" has had brushes with Elvis, Elton John. Cottam rocking one of the specs he designed for Elton John. 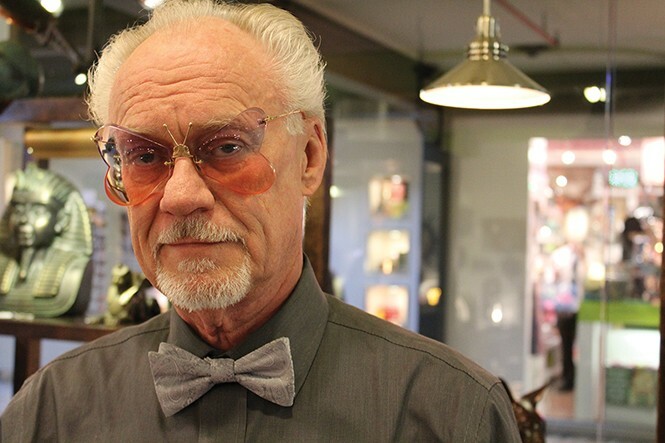 Observing unassuming John Cottam in one of his Trolley Square shops, The Spectacle, you'd never suspect that he's been "Optician to the Stars." But indeed he has. Before relocating to Salt Lake City 20 years ago, the Henderson, Nev., native practiced his craft in Las Vegas—with its bevy of celebs. We chatted with Cottam about his shop and some of his famous clients. When did you decide to become an optician? As a child, I noticed my eyeglasses hurt my ears. So I took a candle, heated the earpiece ... and burned off the end! From then on, I paid attention to people's eyeglasses—and thought I could fit them better. After high school, I started as a lens grinder at a local optical company, and after five years, I took the exam to become a licensed optician. How did you end up in Sin City? I was hired by the Optique Boutique, a high-end store on the Las Vegas Strip, across from the Stardust. Who was your first celebrity customer? One day, I looked up and couldn't believe it. It was Ann-Margaret. I was dumbfounded to be talking with her. Before leaving, she signed the shop's wall. It was amazing. She was the first of many, right? Yes. As time went on, I got to meet some great people with famous names—and a couple of 'gangsters' who were well known in Las Vegas. Each one is a story. I was able to create some fabulous glasses for Elton John, Andy Williams, Phyllis Diller, Dean Martin ... the list is quite long. Any favorites among your celebrity clients? One was Sammy Davis Jr. He was one of the most kind, loving persons I've ever met. Because he was blind in one eye, we were very careful to use the most impact-resistant lens on the market at that time. Tell us about 'The King'—Elvis Presley. Of course, he wore a trademark frame. And when we could no longer get them, I took a broken pair to an aircraft machine shop and had some cast in aluminum. I finished them in my garage, and added the hinges and earpieces at my store. He wore the original frame when he met President Nixon in 1970. You've had some less-than-conventional orders, too? I was contacted by a man from Los Angeles to make some movie props for a sci-fi movie. He wouldn't divulge much, only that the main character was a detective in the future. It turned out to be Harrison Ford in Blade Runner. The glasses were for the Chinese scientist [James Hong] with 'magnifiers, electronics and gizmos.' The studio kept three pairs, and I have the fourth in my other store, The Machine Age. What brought you to Salt Lake City? I longed for a unique space for my own store, and found Trolley Square on a visit here. I felt this was the most amazing mall I'd ever seen. Some folks with 20/20 vision buy glasses from The Spectacle, right? You'd be surprised at how many glasses I make with zero-power lenses for people who want to change their image—to look more professional; more hip. Some lawyers even use them when they address the jury. What are the latest eyeglass trends? Big, mostly 'plastic' frames in black or tortoise, and more and more clear or lightly colored crystal frames. We also make many with mismatched front- and temple colors. Finally, who's Prof. Julian Raintree? He's my alter ego—the mad scientist that creates fun, crazy, unique items I have for sale in my other store, The Machine Age. I take antique and vintage pieces and repurpose them into fun, functional, one-of-a-kind pieces of art, lamps, clocks and decorator items.